Bromølle was built in the 12th century to harness the waters of the Halleby river and provide its owners with an income from the new technology of the age – water power. The water mill is recorded in a written source from 1198. The mill dammed the water in the adjacent boglands of Åmose to keep the millwheel turning in drier spells. Over the centuries the mill dam drained the valley enough for it to be crossed on foot. 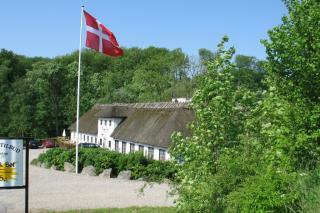 In 1624, King Christian IV granted Bromølle a royal licence as a guest house and post house". Later, a grocer's shop was added, but this closed in 1967. An inn is still kept on the premises, but the mill dam was dismantled in 1772 and replaced by a stone bridge in 1793. " For some 600 years, it made sense for the 36 square kilometres of Store Åmose boglands to serve as wet pasture, so Bromølle could dam water to keep the mill running all year round. But the rationale behind the agrarian reforms of the 1700s brought new ideas about how the bog could be used for farming and peat production if the mill was taken out of operation and the wetland drained. Over time, all these aspirations were fulfilled. The river was straightened and deepened several times so that it now runs in a deep gully past the inn. The largest land reclamation project in 1957-64 drained the bog to the point where its indigenous flora and fauna are heavily in decline, and the last stork has long since flown away.